When initially setting up a pension scheme with NEST (via their website) you will be asked to create one or more ‘Group’ in which to organise employees. NEST then ask you to specify the ‘Payment frequency’ and ‘Earnings Period’ for each group. It is important that the settings you choose match those contained in the Payroll Manager data file, otherwise you may experience problems when you come to upload pension information to NEST. This guide shows you how to set the ‘Payment frequency’ and ‘Earnings period’ correctly on the NEST website. The images below include screenshots taken from the ‘Manage Groups’ area of the NEST website. The NEST website allows you to specify ‘Monthly, Weekly, Tax Monthly, Tax Weekly, Fortnightly or Four Weekly’ as the Payment Frequency for each group of workers. Payroll Manager caters for Monthly, Weekly, 2-weekly and 4-weekly paid employees. If you pay workers on a monthly basis then you should select ‘Monthly’ as the Payment frequency for this group of workers on the NEST website. DO NOT select ‘Tax Monthly’ as doing so would cause problems when you come to submit information to NEST. If you pay workers on a weekly basis then you should select ‘Weekly’ as the Payment frequency for this group of workers on the NEST website. DO NOT select ‘Tax Weekly’ as doing so would cause problems when you come to submit information to NEST. For 2-weekly and 4-weekly paid employees you should select either ‘Fortnightly’ or ‘Four Weekly’ as appropriate. After specifying the Payment frequency NEST ask the question ‘When is your current earnings period due to end’. Follow the guidance below according to the pay frequency of that group. You should set this field to match what Payroll Manager refers to as the ‘last day of the Nominal Pay Month’. The ‘Nominal Pay Month’ is the period for which an employee is being paid. e.g. if an employee is paid on 25th of the month for the work that he does in the calendar month (i.e. 1st to 31st of the month), then the last day of the ‘Nominal Pay Month’ is the 31st. 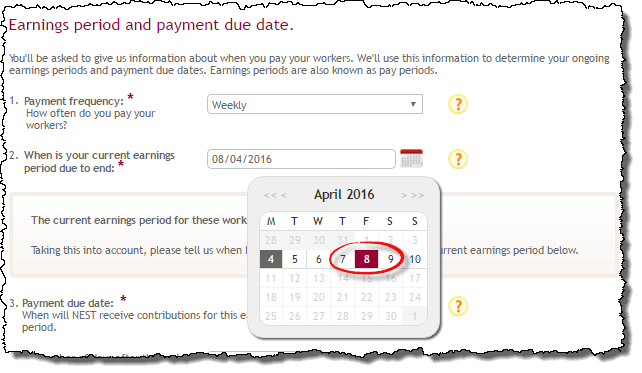 You can check to see what you have the Nominal Pay Month set to in Payroll Manager by clicking ‘Tools’ then ‘Pay Dates’ from the main menu in Payroll Manager, then click ‘Yes’ to the Pay Dates Warning message and click the button marked ‘Set monthly pay dates’. The last day of the Nominal Pay Month is shown at the bottom of the screen. If the setting shows as ’31st’ in Payroll Manager, then you should select ’31st’ on the NEST website (below), otherwise select the appropriate day. For groups with weekly, 2-weekly and 4-weekly paid employees you should specify the day that the employees are actually paid when setting this field. e.g. if employees are paid every Friday then select the relevant Friday on the NEST website. If employees are paid on a Sunday then select Sunday etc..